Miriam Quevedo - Just Beauty Products, Inc.
Miriam Quevedo There are 6 products. Miriamquevedo Extreme Caviar Shampoo For White and/or Grey Hair 250 ml. Miriam Quevedo Extreme Caviar Shampoo is a special preparation formulated with CAVIAR for washing white and/or grey hair, giving it a soft tone eliminating that yellow tint of greying hair and providing softness, shine and intense moisturizing. 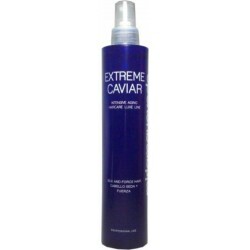 Miriamquevedo Extreme Caviar Hair Spray Solar 250 ml. Miriam Quevedo Hair Spray Solar prepared special for the integral and long-lasting protection of the hair. It contains UVA and UVB solar filters. An invisible film form on the hair that guarantees effective defense in front extreme exhibitions, water, marin chlorine of the swimming pools. Miriamquevedo Extreme Caviar Shampoo for Difficult Hair 250 ml. Miriam Quevedo Extreme Caviar Shampoo for Difficult Hair is a shampoo specifically designed for washing a caring for dried, curly, wavy or wild hair, making it much easier to brush. Miriamquevedo Extreme Caviar Silk and Force Hair 250 ml. Miriam Quevedo Extreme Caviar Silk and Force Hair Finishing treatment restructures and gives softness to the hair, after many drastic treatments like perms, discoloration, dying, drying, or having been exposed to extremely hostile conditions such as sun, wind seawater, or the chlorine in swimming pools. Miriamquevedo Extreme Caviar Special Dandruff Shampoo 250 ml. Miriam Quevedo Dandruff Shampoo specially prepared and formulated with CAVIAR for washing and caring for all hair types affected by dandruff, impeding the rebound effect thanks to a long-life anti-dandruff agent. 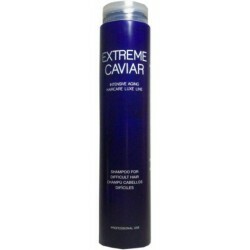 Miriamquevedo Extreme Caviar Special Shampoo For Greasy Hair 250 ml. Miriam Quevedo Extreme Caviar Special Shampoo For Greasy Hair is a special preparation formulated with CAVIAR for the proper care of greasy hair without irritating the scalp, impeding the rebound effect whilst having conditioning properties.